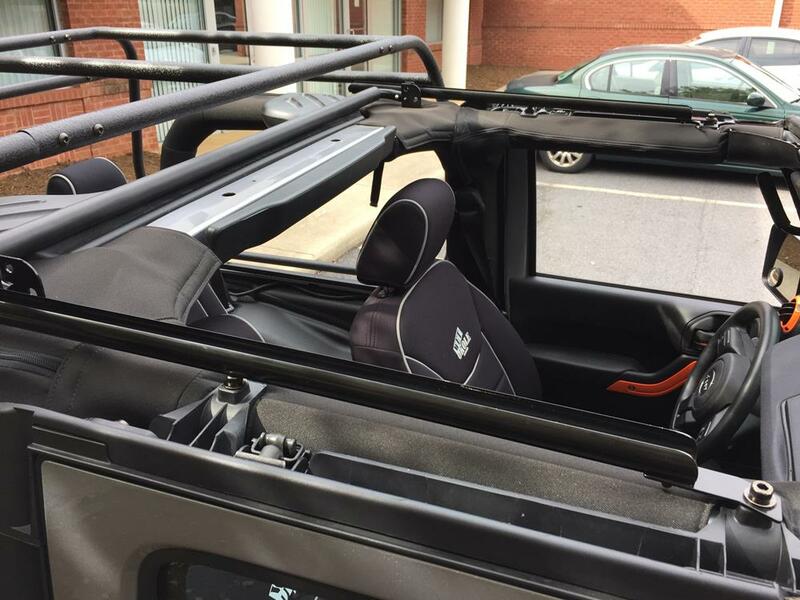 As you may have read in the previous pages, it has been a goal of mine to keep the factory soft top off the Jeep for the whole summer. The plan was a complete success. The Rhino Linings, Wet Okole Seat Covers and Bestop Safari Top worked in tandem to prevent rain from being any kind of issue. 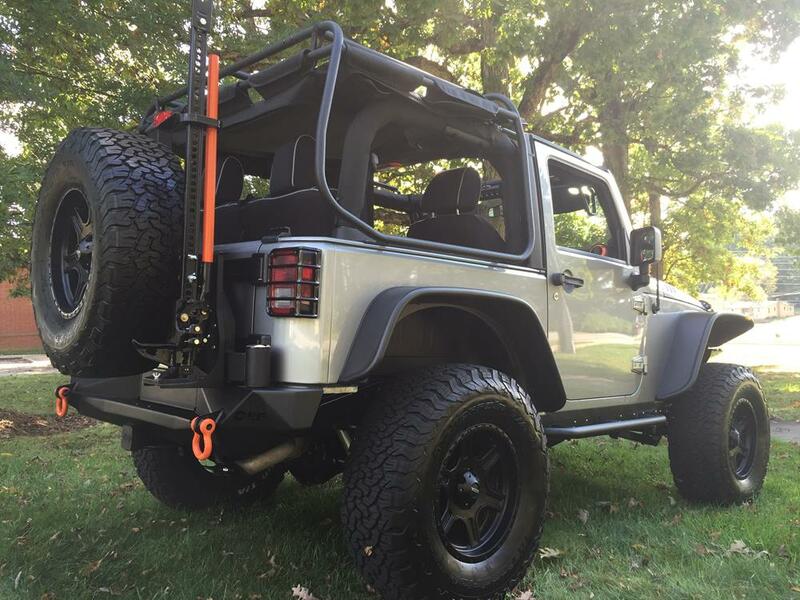 Why then, you might ask, am I adding an aftermarket top to the Jeep? Well for one, winter is coming and as much as I like the fresh air, I don’t think I can manage with the top down through the winter months in the mountains of Western North Carolina. 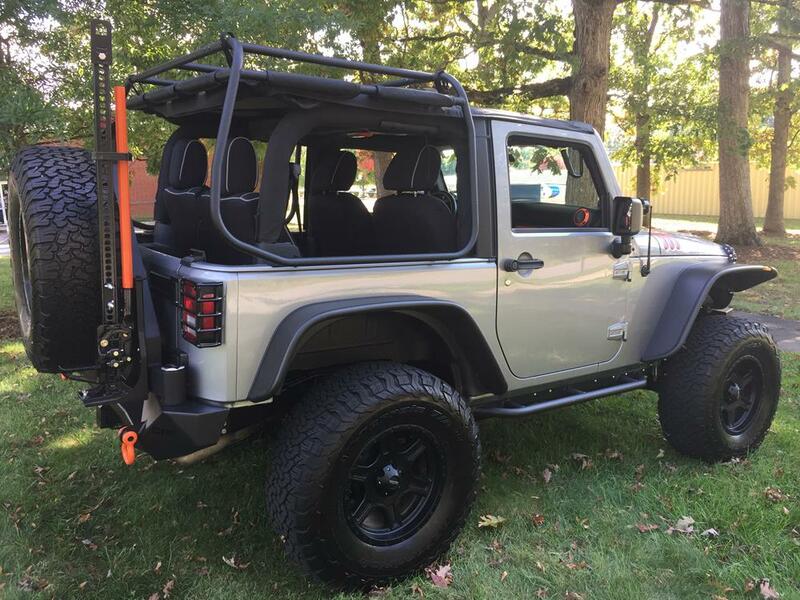 For another, I think the Rugged Ridge Exo-Top, Model 13516.01, adds so much flexibility to soft top management, that I will be able to gain more days without the top in the fall and spring months. So, I will be using this top to help me not use a top even more – if that makes sense? 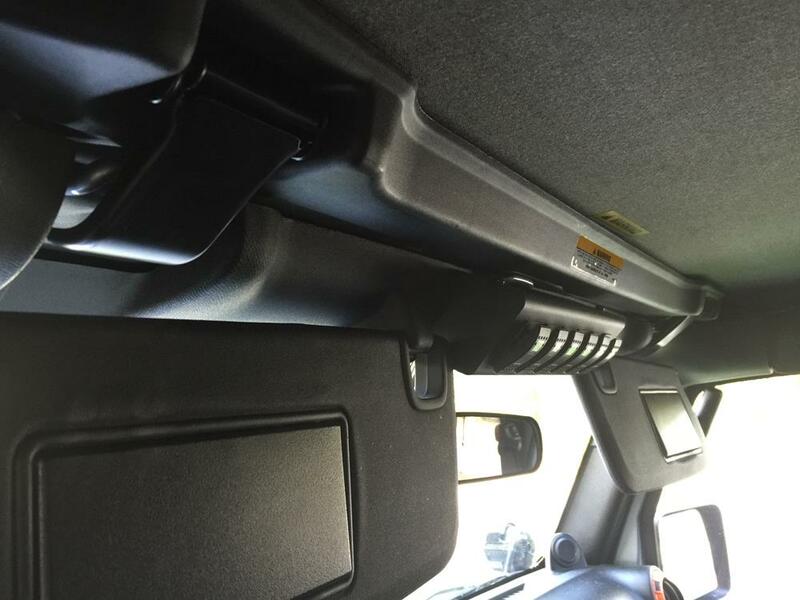 The Rugged Ridge Exo-Top allows you to easily add racks to the top of the Jeep without having to remove them in order to put the top down. 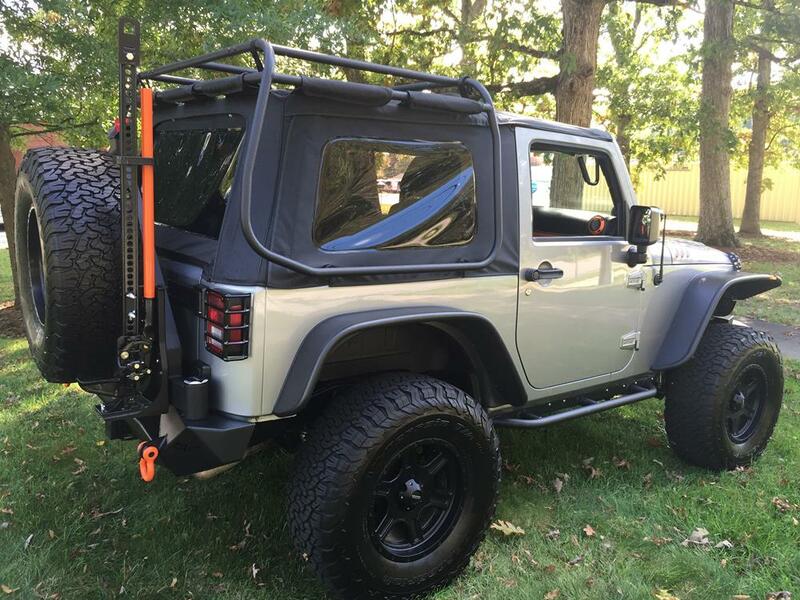 I see a roof cargo basket holding some of the Rightline Gear Auto Duffle Bags in the near future. This set up will allow our family to do more traveling in the Jeep and less traveling in the SUV-another bonus! Putting the Exo-Top together is a big job, so Rightline Gear’s Warehouse Manager, Victor Golden, and I decided to spread out. 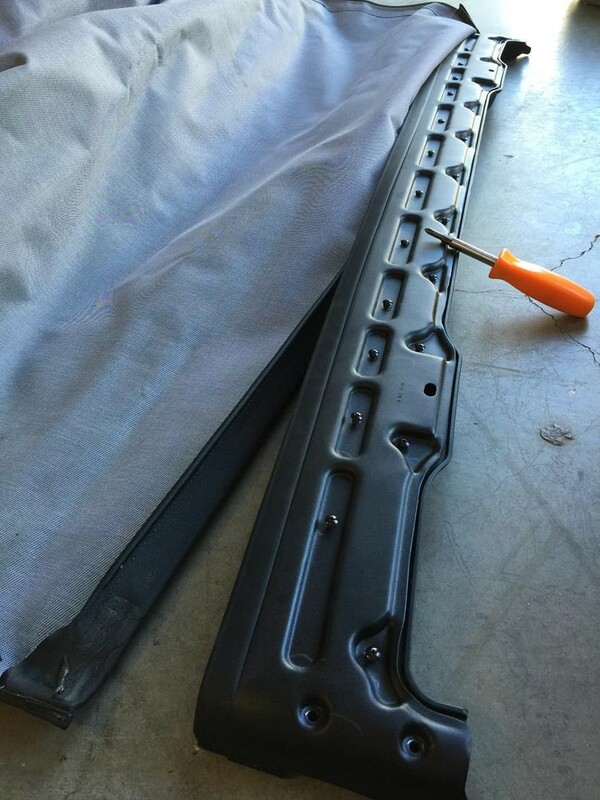 I first retrieved the factory soft top out of our storage and removed its plastic header for use with the Exo-Top. 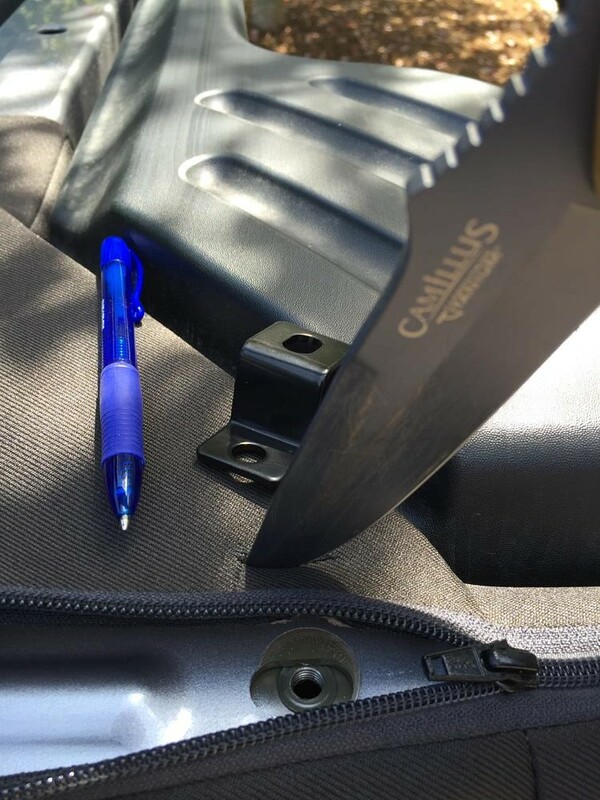 Unfortunately, needing this key piece for the Rugged Ridge Top will make selling your factory top a little more difficult. 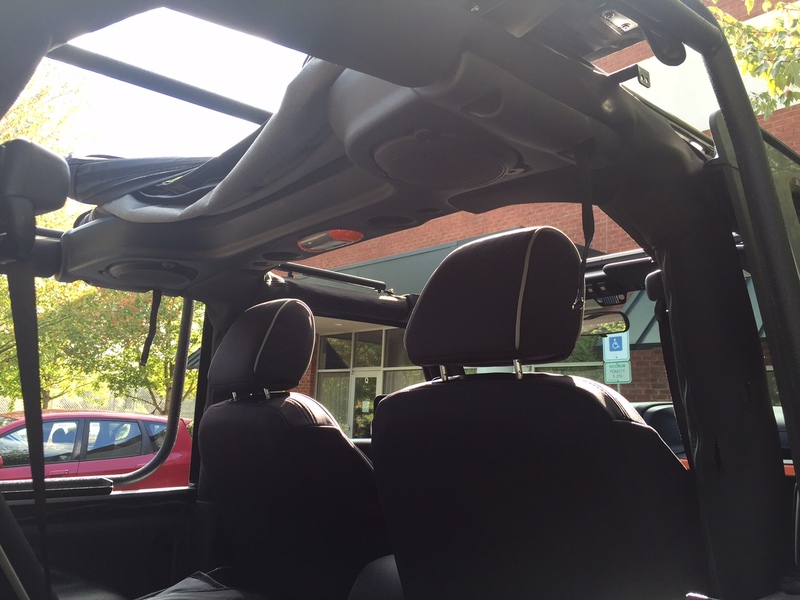 The Exo-Top also uses the rear window rail from the factory top. 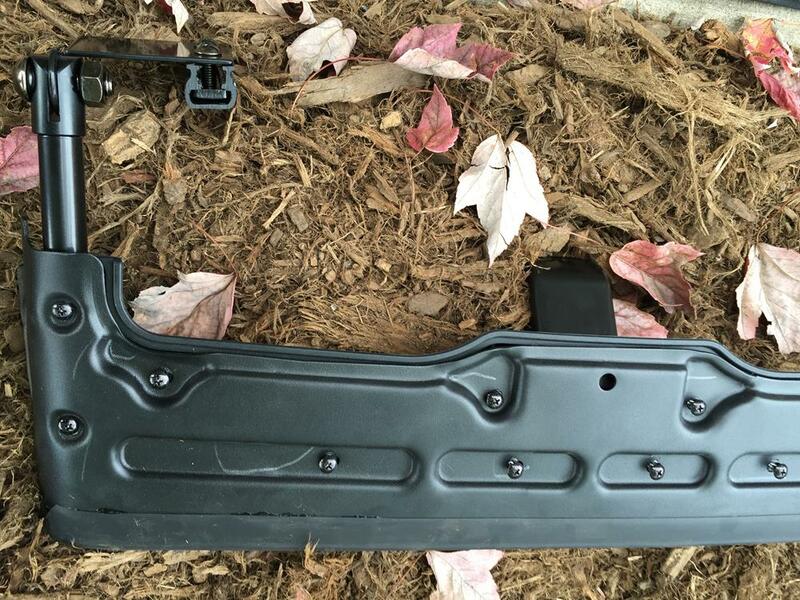 The factory top’s buyer will need to purchase these two parts from Mopar to make the factory top work. I have a good run going on Craig’s list lately, so let’s see how I do! 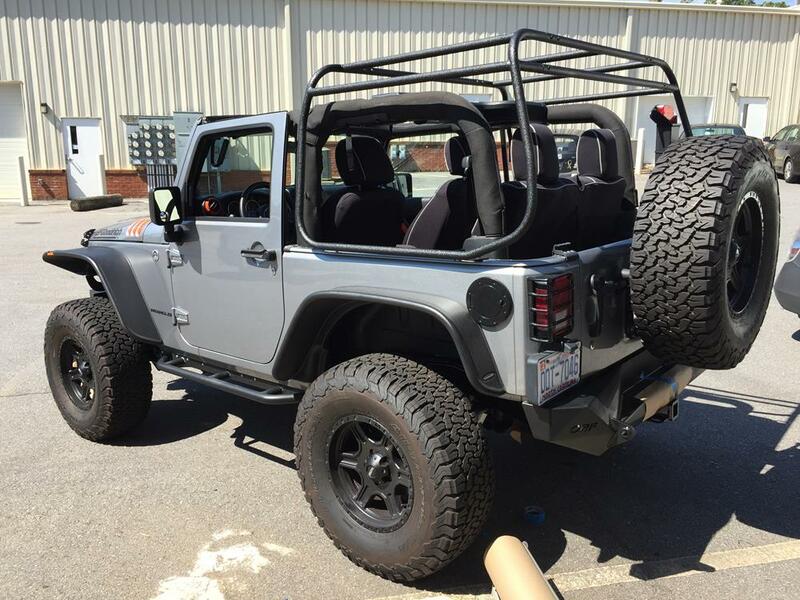 We assembled the cage and bolted it to existing holes in the body of the Jeep. We used Permatex Black Rubber Sealant where each of the cage pieces joined together to keep water from entering inside. I will need to add another round of sealant to these joints at a later time. The sealant went on extremely runny and took a minute to set. I am hopeful that by adding it in layers, I will be able to better fill the gaps at the cage piece junctions. The texture of the cage is what makes the Exo-Top really stand out. Next, I prepared for the installation of the bow (which sits under the top to provide tension) and the slider rails (a set of channels that guide the Exo-Top header forward and back) by cutting slits in the roll bar sleeves. It worked better to bolt the bow brackets and the rear rail brackets on top of the cable bracket. 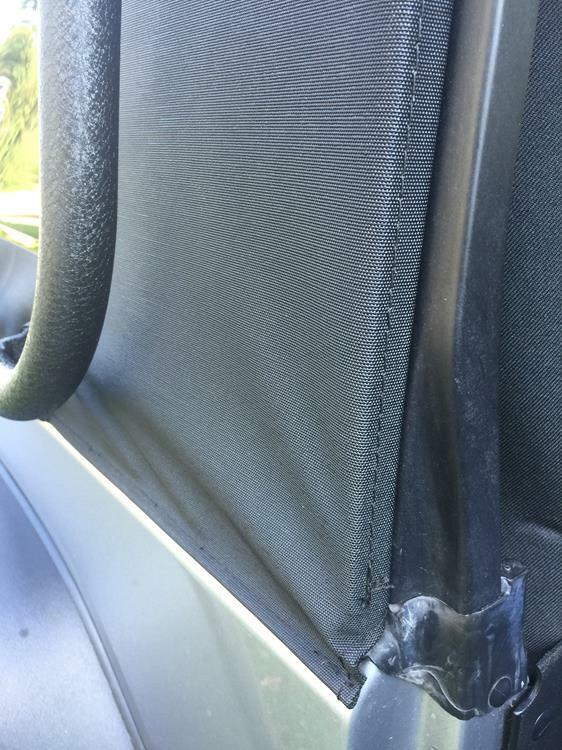 The roll bar sleeves zipped closed with the brackets protruding through their slits. I added the slider rails to both sides’ brackets. Each front rail bracket (the small bracket that extends from the front of the slider rail) needs to be installed along the same line as the slider rail. The Factory knobs that hold the top of the door surrounds in place are replaced with allen head bolts. I added the slider arms to the factory top’s header and then checked that the resultant assembly would easily move back and forth within the slider rails. It was necessary for us to tweak the angle of the front rail bracket to get the smoothest movement out of the assembly. 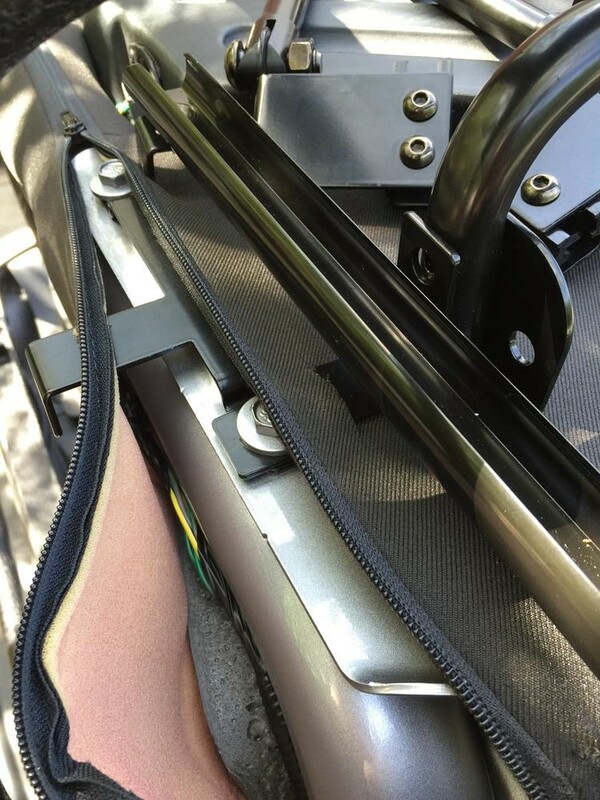 The tension on the carriage that moves within the slider rail can also be adjusted to help improve the assembly’s movement. The Rugged Ridge fabric top slides into the header just like the factory top. It is held in place by tightening all of the bolts that hold the (2) sides of the header together. 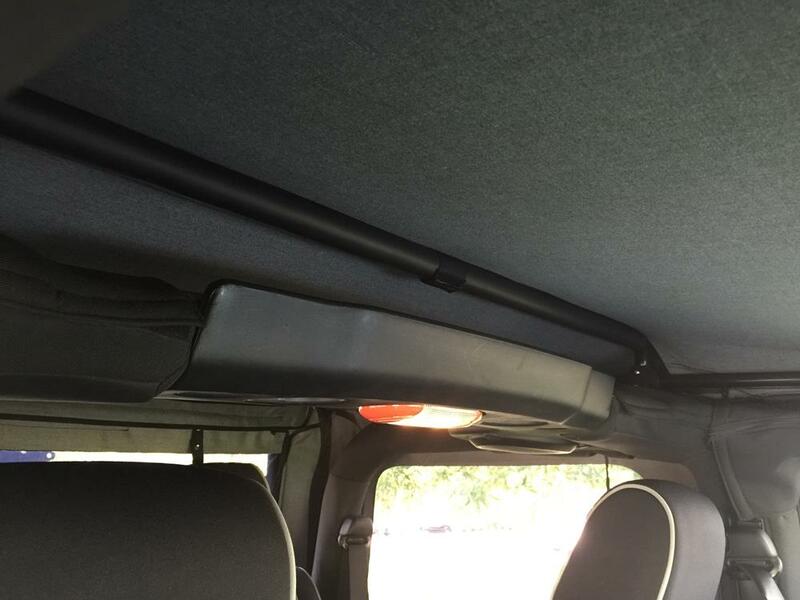 We fed the fabric top over the rear of the Jeep and attached the middle hook and loop flap to the lower rear bar of the cage. We slid the carriages on the slider arms into the slider rails and moved the header all the way to the front of the vehicle. In order to complete this step, the bow must be in its down position. The header clips into place just like the factory top. 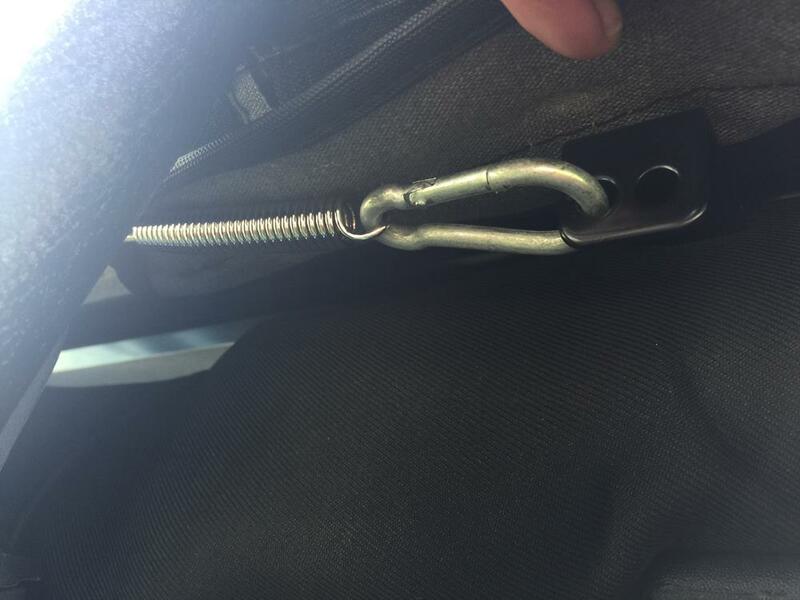 I attached the carabiner that is attached to the soft top cable to the cable bracket on each side. I recommend attaching it to the 2nd hole (this photo shows the first hole). The cable pulls the soft top water tight over the door surrounds. 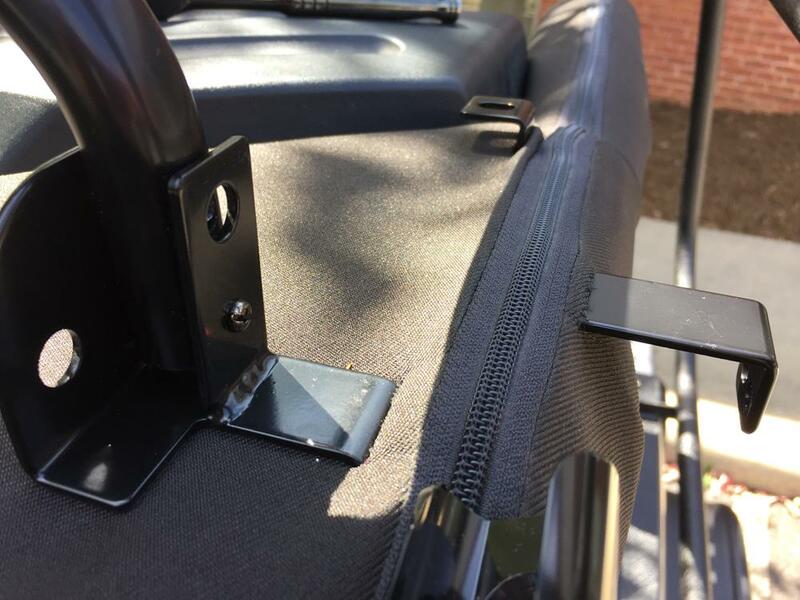 We attached the hook and loop flaps to the cage all the way around the Jeep. I flipped the bow into its up position which puts some tension on the soft top and keeps it from sagging. 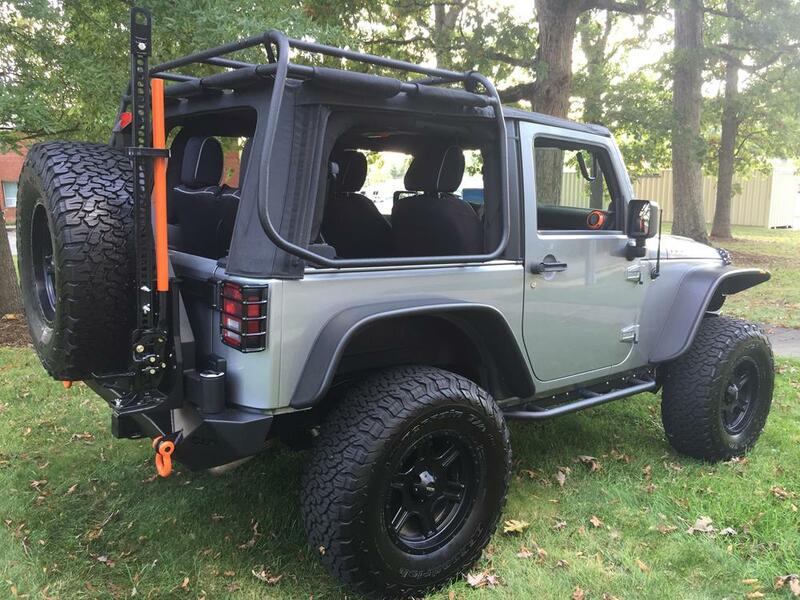 The rear corners of the top attach to the lip around the Jeep, just like the factory top. The (3) clear windows zip in, with the side windows having cutouts to go around the cage. Now off to experiment with all of the different top configurations. Here is the top in the closed position. Here is the top with the (3) plastic windows out. Here is the top with the (2) rear corners folded up to create a safari top. Here is the top with the front portion open in sun rider position. 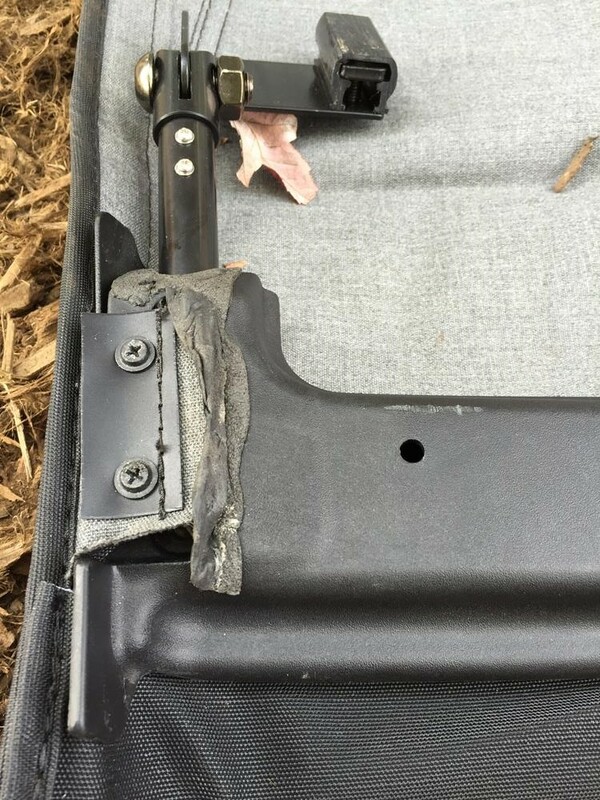 Here is the top folded up in the middle to expose the rear seat area as well. I definitely have flexibility in soft top management. The number of positions for the Exo-Top are truly amazing. 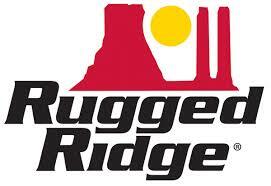 Thank you Rugged Ridge and here’s to more open top driving!